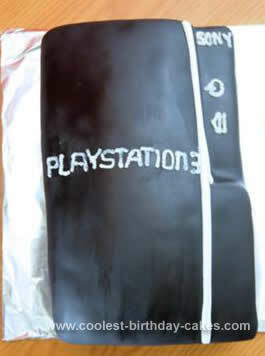 I made this Homemade PS3 Birthday Cake for my brother’s 27th birthday. I baked two 9″x11″ rectangular cakes (it was a small cake, not the PS3’s actual size)one on top of the other with black buttercream frosting as filling. 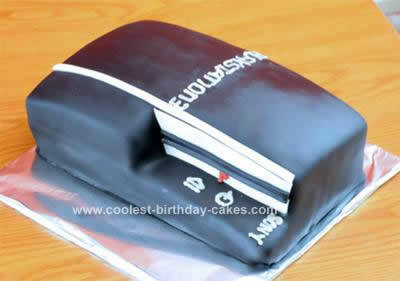 All four sides were cut so it would have the square corners and flat sides but left the top of the cake intact so as to have that curve that the PS3 has. Another piece was cut from the top cake (from the front) to make the place where the disc loads. I covered the whole cake in black buttercream and then in black fondant. The details were made in fondant and the letters were made with buttercream.